Let's Do It for ME! : Matched Donation Offer! His boss at Edward Baden has generously offered to match the amount that Marcus Gwilliam raises for his Brighton Marathon run on Sunday 6th April, so don't miss out on this kind offer if you'd like to DOUBLE the value of your donation to Invest in ME here: http://www.justgiving.com/Emma-Martin84 or by text. Emma kindly wrote this for our blog .. I am writing this on behalf of my fiancé Marcus Gwilliam and myself (Emma Louise Martin). After many years of feeling unwell I was diagnosed with ME in June 2013. In a way I was glad to finally find out what was wrong with me, but on the other hand it was a total shock to discover how our lives were going to change. Simple tasks like getting up and down the stairs, going for long days out, remembering things- all became that much harder. My body suffers daily with the harsh aches and pains, my stomach churns with the constant nausea feeling and the daily drained feeling feels like I'm a car running on empty. I even had to leave my beloved job- a teacher- due to not being able to work full time. Some days I cry, and I'm never sure if it is through pain or sheer frustration. Why me? Why now! Why can't I do what I used to do!? Through every dark day there has been a shining light- my fiancé Marcus. Although he hates seeing what the ME does to me, he is always there to help me, do things for me and keep check on how I am. He is such a star and I am so lucky to be his fiancée, he means the world to me. Just prior to me becoming ill, Marcus decided to take up running, and as well as running just for fun, he began signing up for running events. We were sitting together one day and he asked if there were any charities that support ME sufferers like myself. I told him about Invest in ME - my go to source of information for all things ME related and Marcus kindly offered to do the running events for Invest in ME to help raise awareness about this often misinformed illness. We got in touch with Invest in ME who kindly sent out a pack of leaflets, tshirts and wristbands to help us. We set up a Just Giving page - http://www.justgiving.com/Emma-Martin84 and decided to focus on "The Big One" - the Brighton Marathon. However Marcus has already run in other events- the Great South Run, the Bexhill 10k, the Battle 10k, Bognor 10k, Bexhill santa run, Hastings santa run and the Eastbourne Half Marathon all for Invest in ME. He has also rescheduled his Hastings Half marathon entry for next year's race! Due to the kindness of family, friends and even strangers we have already beaten our initial target, and last week Marcus' boss at Edward Baden in Uckfield said that after the Brighton Marathon he will DOUBLE the total amount raised! ME is a cruel illness that affects so many people, yet is often dismissed as "just feeling a bit tired" or even worse "lazy". I hate having ME, and want the old me back, but without a cure this makes it hard to achieve. 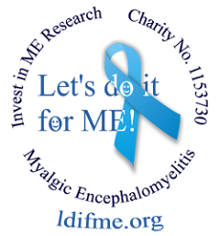 If I have to live with ME, then it is going to join me on a journey of raising awareness and money for Invest in ME, in the hope that one day a cure will be found to help myself, my amazing friends with ME that I have met through being ill (a positive of this illness!) and the millions of sufferers around the world. Thankyou for taking the time to read this and a massive thankyou to all the wonderful people that look after family members/friends with ME. ME we are coming to get you! Big THANKS to Emma Louise, to Marcus for all his marvellous efforts to raise awareness and funds for the cause and to his boss at Edward Baden for such a kind and generous offer of matching sponsorship.